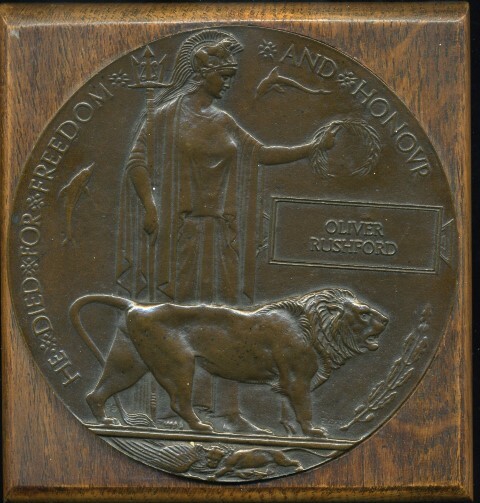 250440 Private Oliver Rushford M.M., 1/6th Battalion, the Durham Light Infantry was killed in action 30 May 1918 and is commemorated on the Soissons Memorial, France. 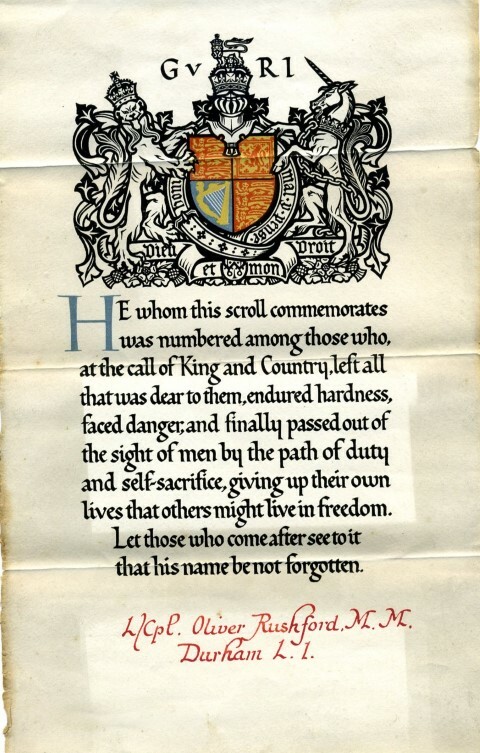 He was 24 years old and commemorated on the Evenwood and Etherley War Memorials and the Rolls of Honour in St. Paul’s Church, Evenwood and St. Cuthbert’s Church, Etherley. In 1901 the family were residents of Wind Mill in the Parish of Evenwood and Barony and Oliver’s father worked as a self-employed butcher (butcher: own account). Edgar was a butcher’s apprentice. By 1911, John, Edgar and Oliver worked as butchers and Fred was a hairdresser. Isabella aged 15 presumably was still at school. The family lived at Wind Mill, near Morley. Frank was not at home. Oliver Rushford enlisted at Bishop Auckland into the local Territorial Force, 6th Battalion Durham Light Infantry being given the regimental number 3803. At a later date he was allocated the number 250440. His service records have not been traced. 26 October – 10 November 1917: The Second Battle of Passchendeale, 8th phase of the Third Battle of Ypres. The following day, by organised bombing, the whole of the final objective was captured and held and communication trenches were dig back to North Durham Street. Following a most trying time on the Somme and the Lys battlefields, the Division was withdrawn and sent to IX Corps then on the Aisne, believed to be a much quieter area. Unfortunately this was not to be the case and the Division was hit hard by another German attack. 3 March, Soviet Russia made peace with Germany and her allies by virtue of the Treaty of Brest-Litovsk. As a result, Germany could now transfer troops from the Eastern Front to the Western Front. More importantly, these Divisions included the original elite of the German Army – the Guards, Jagers, Prussians, Swabians and the best of the Bavarians. In all, 192 Divisions could be deployed in the West. The Allies could field 178 Divisions. A single division numbered about 19,000 men. Ludendorff could call upon about 3,650,000 men as opposed to the Allies 3,380,000. Thus, the Germans now held superiority in numbers. The German High Command needed victory to be gained before the American Forces arrived in Europe in huge numbers. America entered the war 6 April 1917 and in the July, Pershing General of the Armies of the United States asked for an army of 3 million men. The first of her troops arrived in France 26 June 1917. The training and build-up of troops obviously took time but eventually by June 1918, the Americans were receiving about 250,000 men a month in France. This amounted to 25 divisions in or behind the battle zone and another 55 in the United States ready to join the action. The Germans enjoyed spectacular territorial gains particularly during the initial phases of the offensive. 23 March, the Kaiser declared a “victory holiday” for German schoolchildren. The April offensive against the British in Flanders was eventually computed to have cost 120,000 men out of a total of 800,000. The German attack was launched by 4,000 guns across a 40km front against 4 Divisions of the IX Corps. There was a heavy concentration of British troops in the front line trenches and casualties from this bombardment were severe. In fact the IX Corps was virtually wiped out. The bombardment was accompanied by a gas attack after which 17 German infantry divisions advanced through the gaps in the line. Rapid progress was made and the Germans broke though the reserve troops (8 Allied Divisions – 4 British and 4 French) between Soissons and Rheims. By the end of the first day, the Germans had passed the Aisne and reached the river Vesle gaining 15km of territory. 3 June, they had come within 90km of Paris and captured 50,000 Allied soldiers and 800 guns. French casualties were heavy, with 98,000 losses. The British suffered 29,000 casualties. 6 June, the German advance had run out of steam. The first week of April saw the 6/DLI involved in action in what was to become known as the Battle of Lys before it was relieved and sent to join the French troops in the line at Chemin des Dames in the area of Soissons, thought to be a quieter area. In early May, an epidemic of influenza visited the training camp at Arcis before the battalion marched to billets at Glennes, a small village near Aisne. The 6th moved up the line to relieve the 73rd French Infantry in the woods east of the Craonne Plateau. All was quiet until the evening of the 26th May when the message was received that an enemy bombardment was to take place the next morning. 27 May 1.00am: heavy barrage, 3,000 yards flooded with high explosives, shrapnel and gas shells. Afternoon: Lieut.-Col. Walton, a few men of the 8th D.L.I. and 5th Northumberland Fusiliers held the bridge at Concevreux. They were not joined by any men from the front. For the next 2 days, 2 commanding officers of the 6th and 8th D.L.I. found themselves in command of various men of other battalions. After a night at Quisles Chateau, the battalion moved towards Vile-en-Tardenois to support the 74th Brigade. The 151st Brigade Company were ordered to act as advance guard and to seize the high ground north and east of Romigny. This was done but the enemy attacked in force and the Company was driven out to a position south of the village which they held until reinforcements arrived. “VERT la FRAVELLE June 1st – Remnants of Battn (about 35 fighting men) inspected by GOC Divn. About 35 men under Capt. HARE were still in the line and were in action with the French near BOIS de BONVAL. 2nd Composite Bde formed. Lt Col Walton to command 151 Bde Composite Battn. 6 June the Battalion relieved the 9/Cheshires at Montagne de Bligny. The Training Cadres of the 5th, 6th and 8th D.L.I. moved to Dieppe then about the middle of August moved onto Rouen. Private O. Rushford was awarded the Military Medal, the British War and Victory medals.